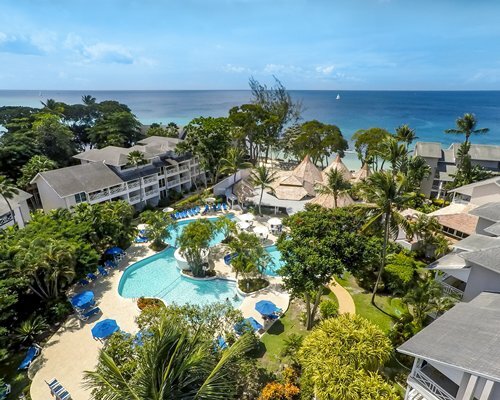 At the All-Inclusive adults only at the Club Barbados, the Caribbean Sea washes up to coral-rock formations alongthe 100-yard water frontage. Each passing wave, a metaphor for your entire stay, erases any thought of the stresses of home and leaves only serenity. 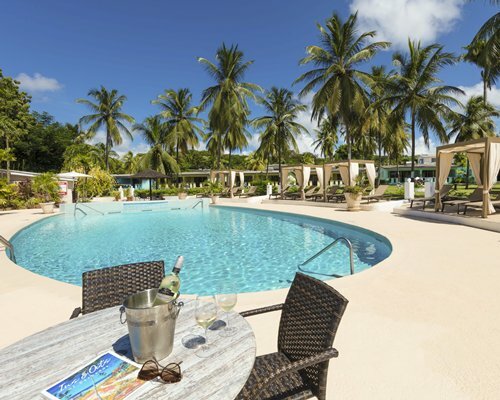 A lounge chair, a good book and maybe a drink - this the recipe for a sunny afternoon well spent in Barbados. A welcomed quiet presides over the resort. Everything seems intimate. 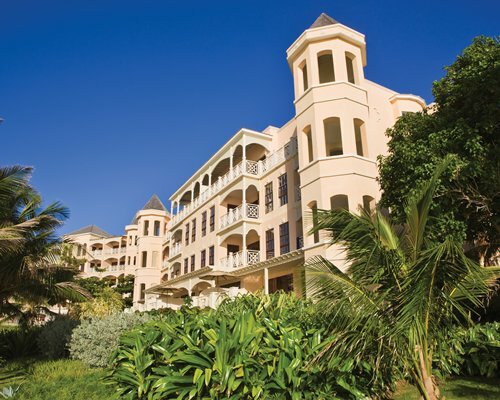 Among lush gardens bursting with vibrant flowers and shrubs, guests meander along cozy walkways, to and from the two- level pool or the spa and back to the ocean. 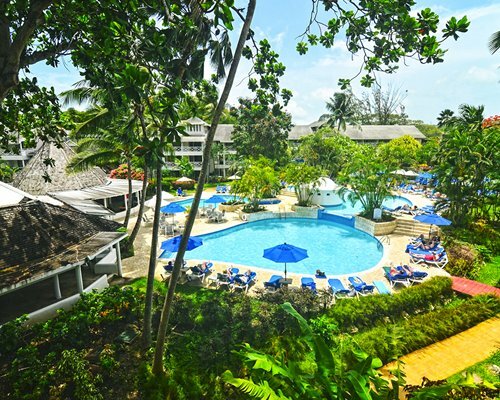 This resort also has a 24 hour front desk and security personnel on site. 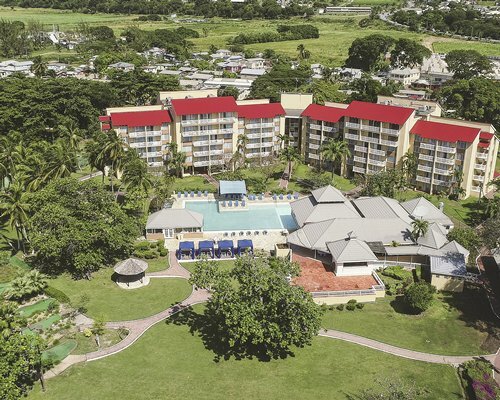 The units at Club Barbados either surround the gardens or pools. Rooms include air-conditioning, private bath/shower or walk-in shower, safety deposit box, ceiling fan, hair dryer, direct dial telephone, alarm clock radio,tea/coffee maker and satellite color television. Most rooms have a balcony or patio, and some have French balconies. All rooms have one (1) king bed or 2 twin SINGLE beds (on request basis only), flat screen TV’s and phones. 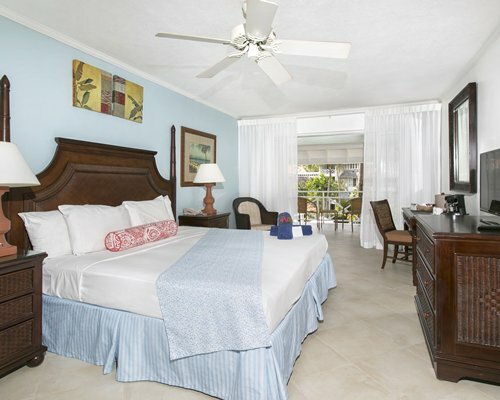 All rooms have Air Conditioning, ceiling fan, private bath/shower, safety deposit box, hair dryer, direct-dial phone, tea/coffee maker, iron/board, satellite color TV and beach towels. Wireless internet access is available in the lobby and main bar. Garden View Units have various views of the tropical gardens or sparkling pools from a balcony, patio or panoramic window. One bedroom Garden View units feature a living room and separate spacious bedroom overlooking the pool or tropical gardens. Mandatory 6 Night All Inclusive Program. Fees are per person, per day. There is a Minimum Occupancy of 2 Adults required per unit. Fees include a 18.75% tax and service. Children under 16 years old are not permitted. 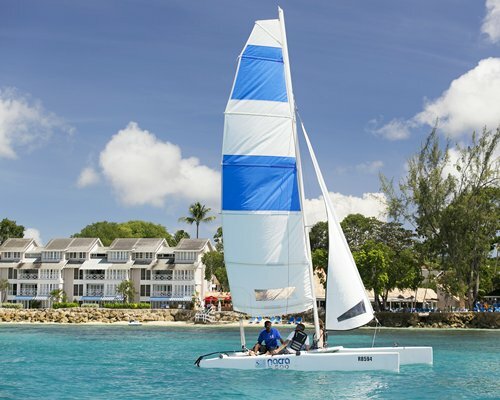 *Program includes all meals (breakfast, lunch and dinner); all beverages (liquors, house wine by the glass, Barbados Banks beer only, tropical coolers and soft drinks by the glass), non-motorized watersports (wind-surfing, sailing, reef fishing, snorkeling, kayaking, Hobie Cat sailing - is chauffer driven only); complimentary boat rides, nightly entertainment, taxes and service charges. 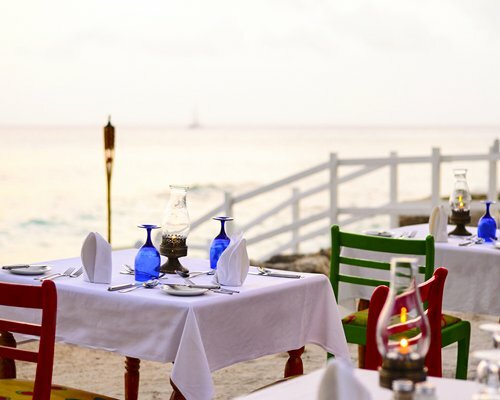 Rates do NOT include treatment & services in the Spa; Arrival & Departure transportation and Barbados airport departure tax. Room service at additional charge. 24 hour check in is provided. Registration card along with credit card information should be returned to guest services within 24 hours of arrival and will have to be returned to operate telephone. All rooms at this resort have maximum occupancy of two persons.